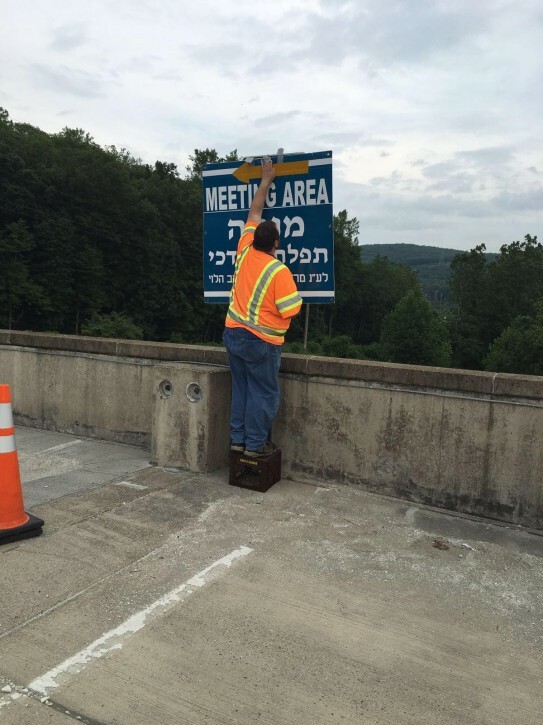 New York - Once again, travelers making their way up to the Catskills on Thursday nights will be able to stop for Mincha and Maariv minyanim as of Thursday, June 21st at the Sloatsburg Rest Area, located on the northbound Thruway between exits 15A and 16. The gathering area will be open from 5 to 11 PM each Thursday night throughout the summer travel season. •	Park only on the upper level of the parking lot, the most private part of the rest area which creates the least disturbance to other travelers, making it the ideal location for minyanim. •	Refrain from parking in handicapped restricted areas unless they have the proper permits. •	Pray only in the designated Mincha area and not in any other locations in the parking lot. •	Refrain from selling any food or merchandise or conducting any tzedaka solicitations at the Mincha area which is designated for davening only. A Thruway representative will be present at all times to enforce this rule. •	Supervise children of all ages at all times, who should never be left unattended in any vehicle, even for just a moment. •	Obey all speed limits and drive with extreme caution when approaching the upper parking lot. •	Yield to all pedestrians when driving or parking. Vending machines on the upper level parking lot will be stocked with kosher food for the convenience of Orthodox Jewish travelers. Organizers are urging everyone utilizing the Mincha Area to follow the above rules in order to benefit all Catskills-bound travelers. The Tefilos Mordche Mincha Area is named in memory of Kiryas Joel resident Rabbi Morton Friedman, who re-established the Mincha Area 12 years ago, Friedman passed away in March of 2010. Why can't ppl daven Mincha at a shul, before they leave rather than in a parking lot? why cant people think before they post?